If you have my book Metamorphosis, you will have seen my world-first photographs of the Vermileonid life cycle. These flies are still little known or understood and are the only known family of flies to create pitfall traps to capture prey during their larval development. I have been rearing a small number for a few years now, to observe and photograph, but my last three finally gave up the ghost and, for whatever reason, failed to reach pupation. I had dug them up to be sure they were dead and had them on my desk for a while when I noticed one twitch slightly. Knowing it was extremely weak, out of curiosity I put a little droplet of water beside it to see what it would do. It's important to bear in mind here, that in the wild they would never have free access to water. All fluids would normally be acquired from prey but this individual drank it quite eagerly giving me an opportunity to observe details which would otherwise be impossible, the water giving a transparent equivalent to sand or food. What I didn't expect was to get such a clear view of the retractable head-capsule and an insight into how they dig their way through soil. 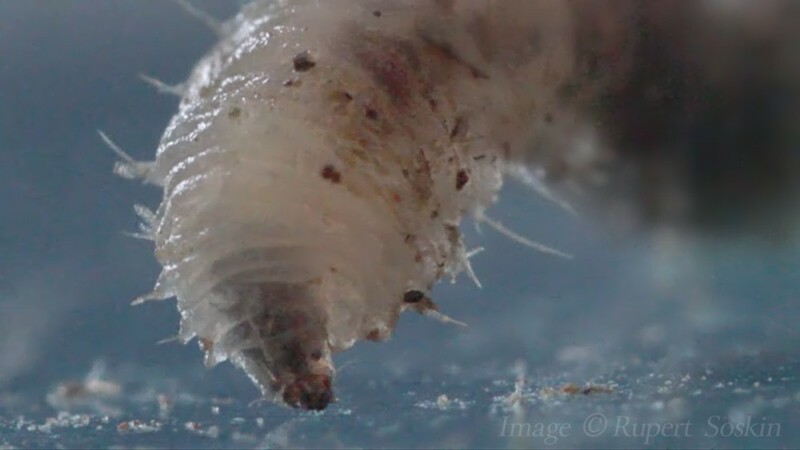 This larva is about 9mm in length, the entire head capsule is smaller than 1mm.